This is the story of a family owned Chinese restaurant, which moves from Chinatown New York to the posh Upper East Side. Wendy Wong befriends the neighbors and helps integrate her family into the community. She and her boyfriend are kidnapped. They escape and rescue the Israeli Ambassador to the United Nations. The target audience comprises youngsters from 6th through the 12th grades. Also anyone interested in the experiences of the Chinese- American youngsters who straddle two cultures. This book is unique, because it is a mystery that plays up the conflicts of Wendy's individual initiative against the elaborate system of Chinese family ties and values. The younger brother, Winston, and the grandparents provide comic relief. Sounds and silence, colorful teen language, rhythm of Chinese names, the ethnic accents of New York, and rumbles of a busy city are the underlying threads of music in this action packed story. The book includes a section on Reading Group Guide. Boston author, Amy Kwei’s mystery novel integrates the conflicting ideas and values of traditional Chinese culture, facing expectations in a Western World. The book is one of adventure — a story of a family-owned Chinese restaurant, which moves from Chinatown New York to the posh Upper East Side. Ideal for Middle School and above, young readers will relate to the lively conversations via electronic messaging between the lead character Wendy Wong, 14 and her best friend, who still lives in New York’s Chinatown. Both feel caught between traditional Chinese family values and the ethos of a modern teen culture. Wendy uses her musical talent and natural charms to befriend the neighbors, helping to integrate her family into the community. Unexpected complications result from their new friendship with the Israeli Ambassador to the UN. Wendy and her boyfriend are kidnapped and the entire Wong family becomes involved in a frantic effort filled with twists and turns, to save the life of their new friend. According to Kwei, the story “is definitely a fusion of many experiences (she had) heard, read or experienced.” Non Asian American readers will learn some cultural aspects that present challenges between Asian and Western thinking. Readers who are Asian or Asian American will identify with the three generations of the Wong family and recognize the experiences of Chinese American children who straddles two cultures. I highly recommend this book to anyone regardless of their gender and ethnicity. Intrigue in the House of Wong poignantly explores the difficulties of a Chinese family trying to fit into the exclusive Upper East Side. However it is not just a book simply about the difficulties of achieving the American dream for an immigrant family. This book has such universal appeal because it explores the ups and downs of a teenager's life. There is a hint of romance between Ben and Wendy. Wendy also has to deal with moving away from her best friend Debbie. It shows that all teenagers share the same problems and joys. But it's a heartwarming story as the neighbors slowly accept the Wongs into their tight knit community. It shows the understanding and empathy that would make the world a better place. I would especially recommend this novel to middle school students. There is lots of action and drama, so it's easy to follow. The reading level is perfect for a student in 4-7th grade. This book definitely pushes the reader to be more accepting and understanding of all cultures, which is increasingly important as our world becomes more global. "Intrigue in the House of Wong" blends suspense with humor as 14 year-old Wendy moves from insular yet familiar Chinatown to New York's Upper East Side where her family plans to open a restaurant. There are obstacles to overcome. The local community board objects to the restaurant's storefront and halts construction. Bricks thrown by hoodlums shatter a restaurant window. And just when it seems the restaurant problems are over, Wendy overhears a possible plot to harm a family friend. Wendy must stop the plot and persuade her parents to go beyond their life-long practice of trusting only fellow Chinese immigrants and learn to reach out to their neighbors. As the first in her family to win a scholarship to an exclusive private school, Wendy feels the pressure of familial responsibility. On one hand, she wants to make her family proud; on the other Wendy would like not to worry about how every one of her actions reflects on her family, as her parents and grandparents keep reminding her. Wendy's instant messages with her friend Debbie and her growing friendship with David DiVario give her a chance as a 'normal' teenager. Her family doesn't even want her to date until college. How can she and David become more than just friends? Ms. Kwei gives the teenagers a modern voice while also explaining the older Wongs' reluctance to interact with non-Chinese. They describe the exclusion laws that curtailed immigration and kept families apart. This is done at a banquet that includes the Wongs, the DiVarios, Mrs. Horton, and Ben Zvis, reflecting New York's multi-ethnic makeup. During the sumptuous courses which Ms. Kwei so flavorfully describes, each guest makes his or her point how each has experienced being an immigrant or newcomer, and how each makes connections, not only through ethnic groups, but work, church, and social groups. Can Wendy foil the plot to harm the family friend? Will the Wongs' restaurant succeed? Only if Wendy can keep a step ahead of kidnappers and only if her family can learn to trust the 'outsiders' they've traditionally avoided. The book includes a Reading Group Guide, making it an excellent choice for a book group or class. A new home, a new school, and mysteries to solve. How does 14-year-old Wendy Wong solve all kinds of puzzles in a family proud of their Chinese culture, even if sometimes at odds with their new American life? 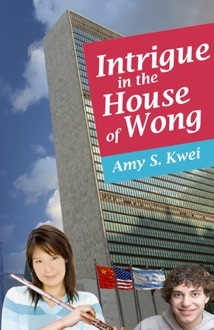 "Intrigue in the House of Wong," a young adult novel by Amy Kwei, blends suspense with humor as Wendy moves from insular yet familiar Chinatown to New York's Upper East Side where her family plans to open a restaurant. Readers can order the book from Tatspublishing.com, B&N, Borders, Wal-Mart, and Costco. The book includes a Reading Group Guide, making it an excellent choice for a book group or class. Anna Fang is a member of the Women's National Book Association/Boston Chapter, the Asian Women's Book Group of Boston, Mass., and the Mother-Daughter Book Group in Lexington/Belmont, Mass.